My experience with the new PlayStation VR has been one of amazement, confusion but most of all fun. RIGs has delivered a fast-paced arcade mech-shooter that had the very same “one more go” feel I haven’t felt since scoring goals in Rocket League. Sports Bar VR at times often fooled me into thinking I was in a living, breathing bar while Keep Talking and Nobody Explodes take teamwork to whole other level. Suffice to say with every new title I try I seem to walk away impressed. Which brings me onto my next venture, Headmaster. No, this is not a school simulation where you play the head teacher. In fact Headmaster is a very different beast altogether and one that lends itself well to the VR headset. You play the role of an unnamed footballer that has been sent to footballing prison by his team (no really) in order to improve his heading ability. If you want to be freed then you’ll need to complete a series of lessons and exams that focus on… you guessed it heading footballs. The game takes a rather simplistic approach in its presentation, any progress in story moved forward by handwritten notes or the sounds of the prison’s owner over loudspeaker informing you of your scores or his mysterious companion Carl. There is certainly an air of mystery and even a slight element of creepiness about this game that’s both unsettling but at the same time totally engrossing. This is no small part down to the fact you never see a single other inmate and the fact a random mannequin continually shows up in lessons for no other reason than to keep you company. If you’ve ever played either of the Portal games then you’ll know the kind of feeling I’m talking about. All in all it works at elevating what is essentially a series of challenges into something more substantial. Lessons take place in a single area littered with targets and rings with the general rule of thumb being the harder it is to hit the more points it awards. Furthermore hitting certain markers could potentially open up more to hit. 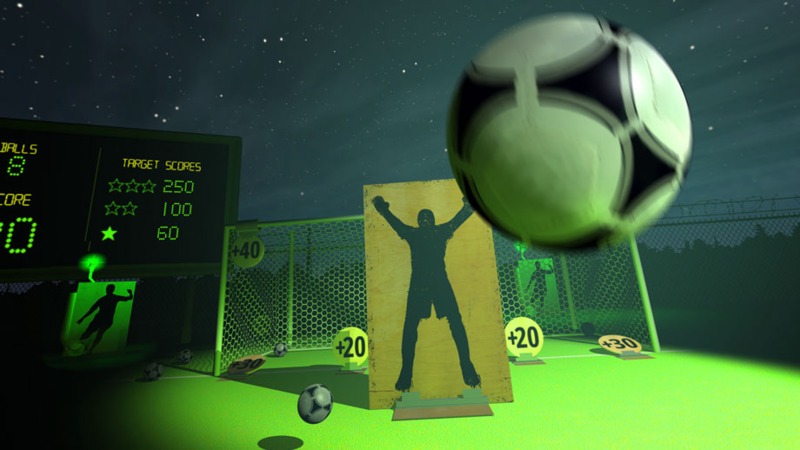 While the idea of continually heading a football into targets sounds like it would lose it appeal quickly, rest assured the game takes the premise to some pretty interesting places. Without giving too much away, lessons will take you to a carnival-style environment complete with moving ducks and balloons and even a bowling alley. The variety is surprisingly wide and will constantly have you rushing through the lesson just to see where you head to next. Lessons have three target scores to try and beat, the lowest often obtainable on your first try or at most a couple of attempts, the highest requiring precise aim and good memory of the where the best targets are. Sprinkled throughout to mix things up a little are exams, longer lessons where the environment is constantly changing and surprising. With around forty lessons in all this is a fairly short romp, but makes sense given the alternative of a bloated experience where the premise wears thin. While I was certainly having a lot of fun playing Headmaster there were many times I kept asking myself, “Am I actually getting any better at this?” Sure there were moments where I felt the ball was going where I intended it, nailing point board after point board but there were just as many where hitting the target felt very much like a game of chance. It’s a case of asking is the game too accurate for its own good or too vague to actually be fair? I’m sure it’s the former but when a game even has you asking these sorts of questions that’s never a good sign and did have me a little concerned. That being said, landing three star scores and acing exams is fantastic. Much like any real course, pass and you’ll feel a great sense of satisfaction and accomplishment. Even better you’ll also be awarded a special bonus item to pimp out your prison cell. Sure while they’re mere cosmetics, its still cool seeing your temporary home fill up with a whole assortment of random nonsense. We’ve discussed the game’s single player campaign in depth and while there is a multiplayer component too it’s a little limited with the promise of more options at a later date via updates. Taking it in turns to compete for a high score at the moment though has its novelty and hopefully future modes offer some surprising extras. Headmaster is an odd one. It’s a game full of so much charm and character that it had me eager to see where the prison would take me next. Then again actually playing through these lessons also had me cursing one minute as to what I was doing wrong and punching the air in triumph the next. You know what the say about banging your head against a brick wall? While Headmaster certainly doesn’t go that far, there are times it can come dangerously close. While the prison claims to test its residents in heading balls effectively, perhaps it should also consider adding patience to that list to. Summary: Short, sweet and a little frustrating.